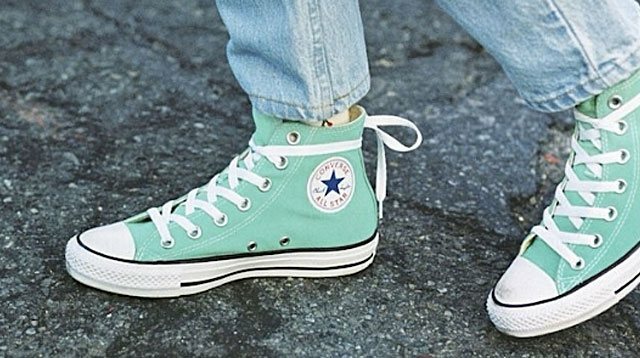 The early 2000s were peak Chuck Taylor season for many millennials—they were right up there with ballet flats and flip-flops. You were either a staunch supporter of the classic black and white shoe or the type to experiment with different colors—maybe you even preferred showing your creative side by doodling, painting, or writing on yours. Regardless, there's likely one detail we've all wondered about when it comes to Converse's iconic shoe: What are those holes on the sides for? According to MarieClaire.co.uk, there are actually two good reasons. First and most obvious: to let your feet breathe. Since the All Stars were initially conceptualized as a basketball shoe, it made sense to have holes that "provide ventilation… and help stop your feet getting sweaty." The second rationale is less functional and more creative—those holes were "designed to allow you to get imaginative with your lacing techniques." In this case, they work like your typical shoe eyelet and allow laces to be strung through them. Not sure how that would look, but we do recommend extra-long shoe laces before attempting this.